← Comsewogue Returning RTTT Funds! Can you hear us now John Flanagan? 4 Responses to Can you hear us now John Flanagan? 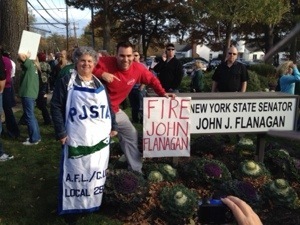 Fire John Flanagan! This gets MY VOTE! Dump the deaf NYS commish of Education, and the Board of Regents who support him. Senator Flanagan says we should not act haste fully to get rid of these high stake tests; yet he was the one who helped implement them quite haste fully. The very reason most people may be against the tests is the fact that they were just forced upon our students and not thought out well. So it’s ok to act haste fully when implementing a new process no one knows anything about, but to not act haste fully when we should get rid of them when we know they are no good? This system is hurting children and children… young children are hurting themselves due to these tests, yet our elected officials still won’t throw them out??? Why??? This makes no sense. We are hurting young children and it has to stop! You can answer that question by following the money trail.